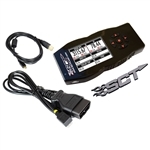 Edge Products Insight CS2 Monitor The SCT 7015 X4 Power Flash Programmer provides your 1999-2016 Ford 7.3L/6.0L/6.4L/6.7L Powerstroke with pre-loaded, dyno-proven power tune files that INCREASE HORSEPOWER and TORQUE!! VEHICLE DATA OVERLOAD. With a HUGE Backlit display, the SCT X4 Power Flash makes it EASY to read the Real Time Vehicle Data, view popular sensor data such as EGT, Air / Fuel Ratio or any other 0-5 Volt source! Clearing DTCs - Reads & Clears PCM Diagnostic Trouble Codes. Data Logging - Need to monitor your vehicle's engine parameters? No need for a separate monitoring device. View & record your vehicle's PCM data on the device or on a PC. Easy Restoration Back to Stock - The device backs up your factory PCM program during installation should you ever need to return your vehicle to the stock program. Restoring your vehicle to the stock PCM program is as easy as selecting "Return to Stock" from the device menu. Full Color Backlit LCD - Display Full Color LCD display for easy viewing, day or night. Installs Quickly & Easily - Installs quickly & easily via your vehicle's OBDII port. User Adjustable Vehicle Parameters - Adjust for common performance bolt-ons such as Cold Air Kits, Exhaust Systems & Gears Edge Insight CTS2, easy-to-install is cost effective and has a standalone multi-gauge display.